George Graham Revues Maddy Prior's "Ravenchild"
The English folk-rock scene has shown remarkable durability, not only among the performers who originated the style in the 1960s, but in the continuing interest by different generations of fans. The revival of Celtic music has, in recent years, sparked a great deal of interest in the folk music of the British Isles, and many younger performers are specializing in Irish and Scottish traditional music. But there has been less of a revival in English folk. A few younger bands and performers have emerged over the years, such as The Oysterband, Kathryn Roberts and Kate Rusby and more recently, Equation. But it is the veteran performers, including members of the three original groups who popularized English folk-rock who are the most active and continue to make worthwhile new music. The members of Fairport Convention, including the band itself and its founder Richard Thompson, The Pentangle, including vocalist Jacqui McShee and founding guitarists Bert Jansch and John Renbourn, and Steeleye Span's lead vocalist Paddy Prior, along with another veteran English folk vocalist June Tabor have all been releasing fine new albums in the last year or two. 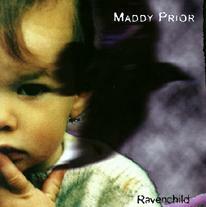 The latest is a new recording by Maddy Prior called Ravenchild. Ms. Prior, like Ms. McShee, Ms. Tabor and the late Sandy Denny of Fairport Convention, is one of the highly distinctive female vocalists who helped to define the English folk-rock sound, which though it might have had rather electric instrumentation and presented original music, had an aura of timelessness that often evoked ancient misty castles and enchanted forests. Ms. Prior's new recording continues in that vein, drawing on a good deal of traditional material, but also featuring some interesting original tunes, or in some cases combining original lyrics with traditional music and vice versa. And through it all her often-haunting vocals can range from cooly celebratory to doleful. She even tries a couple of stanzas of what could be described as Olde English rap. Like her past two US-released albums, Ravenchild has suites of songs that revolve around a specific subject. In the past she did a collection of compositions on the seasons of the year, songs inspired by the rabbit-like animal the hare, and this time she does a cycle of songs inspired by Napoleon's invasion of Russia, and about ravens, the birds which served as the inspiration for the album's title. While English folk rock has long been associated with string instruments, such as fiddles and mandolins as well as guitars, the instrumentation on this CD, like Ms. Prior's last two, is dominated by the keyboards of Nick Holland. This time, Holland plays a real piano, which is a marked improvement from the rather unconvincing synthesized piano Holland played on Ms. Prior's last CD from two years ago, Flesh and Blood. The other personnel remains the same as on Flesh and Blood, Troy Donockley who plays a variety of instruments from a very electric guitar to the Irish Uillean pipes and cittern, which is a kind of oversized mandolin, plus Terl Bryant playing percussion, rather than a drum set. A new member of the cast on this recording is Nick Beggs who plays Chapman stick, and uses it to provide sounds ranging from ethereal to a funky bass. Also carrying on a tradition from Ms. Prior's recent solo recordings, the songs in the suite flow from one to another, and most have instrumental interludes that provide the transitions. The arrangements on the CD are quite interesting, and in some ways unexpected. Though Ms. Prior has recorded before in a keyboard dominated setting, and June Tabor also does the same, it still remains a distinctive sound hearing such traditional-sounding music in such arrangements. Ravenchild represents Maddy Prior's 35th album, including the Steeleye Span records, plus her various solo and side projects. It is also her 35th year of performing. The veteran English singer has only gotten better with the passing of time. Her voice maintains that rare trait of seeming to speak across the ages, with her distinctive combination of clarity with subtle ornamentation, a kind of detached quality with the ability to conjure powerful images. Her new CD is one of the best of her solo career. The combination of traditional and original elements, both musically and lyrically, plus the interesting keyboard-dominated arrangements make for satisfying, distinctive and evocative listening. Her musical associates on the CD do an excellent job, especially keyboard man Nick Holland, who this time gets the benefit of a real grand piano. Sonically, the CD is also a class act. All of the instrumentation is well recorded, and Ms. Prior's vocals are treated especially well. There is nice balance between a spacey atmospheric quality and the intimacy of the small group. The CD also has a respectable dynamic range, increasingly a rarity these days. The English folk scene's best practitioners still seem to be the artists who were there from the beginning. Maddy Prior once again creates memorable music, while keeping the style fresh with interesting new ideas.